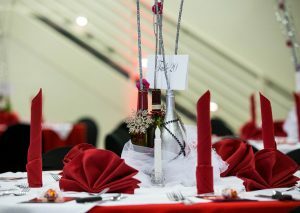 Beginning in February 2015 on Valentine’s Day, Traditional Elegance introduced it’s signature “Black tie” Valentine’s Ball in the Macon area. Heading into our 4th year, it has been an experience like none other, and for which our local community and “out of towners” look forward to each year. 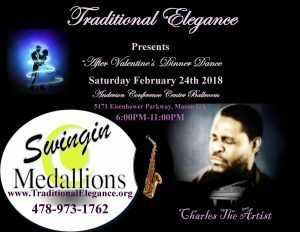 It began with entertainment in tribute to the Motown Era and it’s distinct music which remains timeless & unconditionally loved across generations; fine dining with wine, classical and urban ballroom dancing, and one of it’s main highlights being a GRAND Prize Vacation for two to somewhere exotic. Since that time, the event has gotten better and better and even more elegant and has become a staple event in the Middle Georgia Community. 2018 Promises to be another show stopper with LIVE entertainment by the Swingin’ Medallions, and none other than Middle Georgia’s own “Teddy Pendergrass” and “Luther Vandross” wrapped up in one. Silky smooth Charles Jones AKA “Charles the Artist” will absolutely WOW the audience with his soulful voice to the much loved tunes of these icons. The 2018 beneficiary organizations will include two local non-profit organizations. Caring Solutions Pregnancy centers and the Georgia Kidney Fighter’s Support Group, Inc. Both very worthy organizations making immense differences in the lives of so many. So if you are looking for something special to do in the 2018 Valentine’s season, head our way! Seating is by reservation hence tickets to the event are Pre-Sold only so please Purchase Your Tickets Here and take a look at Our Menu Here we’d love to meet ya, and give you a hearty welcome the Traditional Elegance Way! In the previous article, I shared where to start with your event planning. Now that you have completed your outline of the WHAT, WHY and RESULT/IMAGE of your wedding or special event, you may be ready to get some help but perhaps you are puzzled about who and how to choose. First there is a need to understand the kind of planning help that might be available followed by deciding how much help you might want or need. While there may be variations in descriptions, there are three main types of planning services offered. Full Planning Services– This category involves the full planning and designing of your event where the responsibility falls to the individual or company you’ve hired. To make things easy, consider this a turnkey service. Your responsibility is to share your vision, approve the design, pay for it and show up, whereas the full service planner’s responsibility is to design your event including all the fine details, select the vendors, coordinate your event and bring to life your vision. This is usually the least stressful and most costly service. Consultative Planning Services: With the consultant, this category provides you with the services of a professional to guide you as you plan and design your event. When you choose this level of service it is to avail yourself of the professional’s expertise and recommendations. You will be guided on how to go about designing your event, how to select vendors for your event, as well as provided input on how the event should flow. You then take that information into consideration as you get to work on designing and planning your event. Depending on your agreement, the consultant may also serve as your coordinator on the day of your event or, if appropriate you may coordinate the event yourself. Consider this service like a cafeteria where you choose the amount of help you would like from the consultant. As you will notice, the primary difference in each category is the level of services provided. Now that you have an idea of the services that are available, review the event outline you prepared, give some thought to your tolerance level and determine how much help you will need. Start making telephone calls to event professionals and make your appointments to meet with them. Among the questions you might consider asking are (1) what kind of events do you do? (2) How long have you been doing this? (3) What motivated you to do it? (4) Are there any reviews of your work? With the above you are well on your way with your selection process. So you are thinking of planning that special event, or perhaps you are getting married and need to begin your planning process. Where do you start? If you are the guy the first thing you begin to consider is “how much it’s going to cost?” Hmm I think that’s in the gene of every guy I have spoken with… how much? So how do we reconcile cost concerns and making the event or wedding pretty? How can you realistically project the cost or be able to establish a budget until you know what you want to do with your event? With the above in mind I want to share a few tips on planning: I call them the WHAT, WHY and RESULT or IMAGE of an event. First think about WHAT kind of event you would like to do. It doesn’t matter what it is. It could be a reunion, networking, sports related; beach event, retreat etc. or it could be you need to plan your wedding. Write it down! WHY you would like to do that particular event. What is your purpose? It could be a fundraiser, a just for fun event, you are getting married, a business promotion event, there could be any number of reasons for your doing an event. Think about your vision or the RESULT/IMAGE of your wedding or other special event. Close your eyes, that’s right…, close your eyes, dream freely, and imagine yourself at your event. Envision the final product and what you want to accomplish. Write it down! With your outline in hand, you are ready to start shopping for an event planner to work with you. Look for a planner that will provide a complimentary initial consultation, take your outline with you and share that with the planner. Remember this is only a preliminary consultation to establish if there is a good fit. Are you comfortable at that initial meeting with the planner… and is the planner comfortable with you? 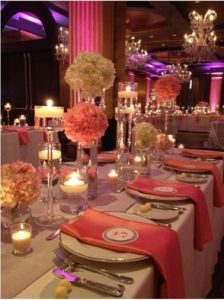 At or soon after that meeting, you will be in a better position to decide if you would like to request a formal proposal or quote for that planner to manage your event. Based on what you have submitted, the professional planner will be able to provide you with a written proposal regarding your event as well as the cost. The planner will also review that proposal with you to make sure all the details are covered as well as to answer questions you may have. At the conclusion of this process you will have a pretty clear idea of the quality and image of your event- what your event should look and feel like and how much it may cost you. Your wedding or event is special to you and should be given the professional attention it deserves.